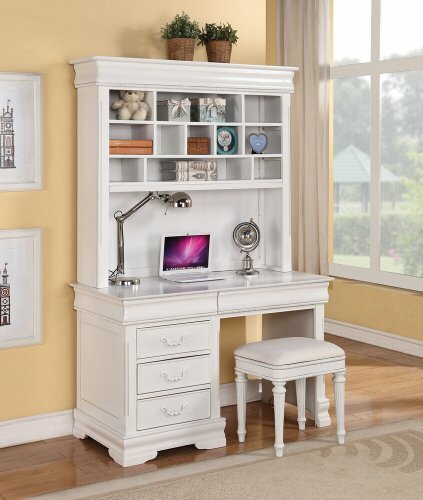 Classique collection white finish wood children's desk hutch and stool by ACM at Main Street Living. Hurry! Limited time offer. Offer valid only while supplies last. Classique collection white finish wood children's desk hutch and stool. Desk features 5 drawers , hutch with multiple shelves and a padded stool. Classique collection white finish wood children's desk hutch and stool. Desk features 5 drawers , hutch with multiple shelves and a padded stool. Desk measures 50" x 24" x 30" H. Hutch measures 50" x 12" x 44" H. Stool measures 18" x 15" x 19" H. Some assembly required. If you have any questions about this product by ACM, contact us by completing and submitting the form below. If you are looking for a specif part number, please include it with your message.